I have loved horror as long as I have loved my blackness. Some of my earliest memories are of sitting in my mother’s lap while she braided my hair, the glow of all sorts of monsters and ghouls from her small black-and-white television washing over us. Horror may seem like an unlikely obsession for a young black girl growing up on the shores of Miami. But so much of blackness in America carries an undercurrent of dread, in which the prosaic points of everyday life — wearing a hoodie to run an errand, attending church, passing a huddle of cops while walking through your own neighborhood — are fraught with meaning and reminders of the potential for violence. As a child, I learned that the world would be hostile toward me by virtue of my blackness at the same time I came to understand horror. It’s an exceedingly elastic genre, one that’s able to seduce, revile, inform, and move you, often within the same moment. In its second, discursive season which ended last week, Atlanta is at its most elegant and impactful when using horror in this manner. Creator and star Donald Glover, director Hiro Murai, and the show’s all-black writers room have repeatedly used the genre to consider the horror embedded within black American identity and experience. In particular, the price of aiming for fortune as artists, internalized racism that leaves physical wounds, and our relationship to whiteness — which is less a specific monster the show deals with head-on than a pathological stain infecting people even when it remains unseen — are crucial thematic underpinnings to how the characters on Atlanta wrestle with their own identities. Glover and his collaborators don’t unpack blackness for an audience, white or otherwise, that’s unfamiliar with its vernacular. Instead, they mine the fraught internal dynamics of how these individual characters live with their blackness in an environment that can often be hostile toward it. In its second-season premiere, Darius (a laconic, delightfully philosophical Lakeith Stanfield) recounts what amounts to a demented fable about “the Florida Man,” an elusive and unidentified white man responsible for the harrowing unsolved crimes the Sunshine State has earned a reputation for. The violence in this sequence — the Florida man sits crouched on asphalt eating a crumpled human being with blood streaking down his jaw, then walks up to the car of an unsuspecting black teen to shoot him in the head — sets the tone for what comes later in the season. The violence is jarring, gruesome, and touched with broader racial relevance. The sequence takes the tenor of a dream. Florida Man comes to feel less like a recounted news story and more like the kind of warning kids pass around the campfire. He’s a boogeyman by way of a sun-kissed Freddy Krueger. Later episodes lean even further into horror. “Helen,” the season’s fourth episode directed by Amy Seimetz, feels like a riff on Jordan Peele’s Get Out for how it deals with a black man coming into a white setting in order to discover a new side of his partner. But it proves more prickly and complex than the work that inspired it, as the partner in question is a black woman herself, touching the nerve of what it means to be biracial. Taking place at the German Fasnacht celebration, the episode first seems to be concerned with unpacking the violence that white people pointedly enact upon black people by exploring Earn’s (Glover) discomfort at the event. Early in the episode, a white woman bounces up to Earn exclaiming, “No way! You look so good!” her hand lightly touching his face, checking for makeup. She’s mistaken him for the white man dressed as a Moor, only to realize with abject embarrassment that he’s an actual black person. But Atlanta typically doesn’t use the ignorance and racism of white people to inject horror in its stories, at least not directly. The writers seem more interested in the horror that blooms inside and among black people. The episode goes on to upend expectations, focusing on Van’s (Zazie Beetz) relationship with being biracial, and her anger at being seen as an appendage in Earn’s life. Van’s security in how she defines herself as a black woman is chipped away continuously throughout “Helen.” When she tries to find some communion with the only other Afro-German in attendance, Christina, who is also a childhood friend, a frustrating conversation ensues. Christina notes that Van always “chose black” as if she “needed” that identity as a compass, not as if it was natural for her to do so. The episode tips from an undercurrent of dread to outright horror in a scene centering on Van, with a setup many horror films have used to great effect: a beautiful woman walking down a desolate alley in the dead of night as a menacing laugh and masked figure emerges from the shadows. By the time Van bashes the costumed figure behind her in a fit of fear and anger — a traditional mark of this celebration — it feels like a manifestation of how in flux her relationship with her identity currently is. “Woods,” directed by Murai, is perhaps my favorite episode for how it considers the season’s clearest arc: Alfred’s (Bryan Tyree Henry) struggle with his growing fame as the rapper Paper Boi. After a failed excursion with his not-quite girlfriend, Alfred gets jumped by a trio of fans before escaping into the woods. The familiarity of Atlanta’s concrete landscape gives way to the strange and the harrowing. His mouth dripping with blood and skin slick with sweat, Alfred wanders around the woods looking for an exit. The episode is the most conventional in its horror setup: a man lost in terrain that was once familiar but now feels alien, the dead deer rotting as a warning of potential violence, a strange figure speaking ominously, who could be friend or foe, depending on his mood. What makes the episode powerful rather than conventional is how Murai frames the rumbling cacophony and shadowed grooves of these woods as Alfred’s subconscious turned flesh. Soon, everything he experiences comes across as emblematic of his own struggle to remain authentic to the life he’s lived, perhaps afraid that embracing fame to such a degree may upend who he really is. The finale, while lacking any of the horror cues that define so much of the season, details how he keeps Earn around because he provides a grounded sense that his growing profile makes difficult to maintain. The way Glover and his collaborators use horror this season makes it clear that the show isn’t primarily interested in detailing the strictures white racism has inflicted on these characters, but in charting their internal lives and how they relate to being black in America. Nowhere is this more explicit than in the critically lauded, brilliant, and horrifying episode “Teddy Perkins.” It’s interesting to compare the episode to Glover’s other notable accomplishment this year, “This Is America,” the Childish Gambino music video he released ahead of the Atlanta finale last week that got a rapturous public reception. 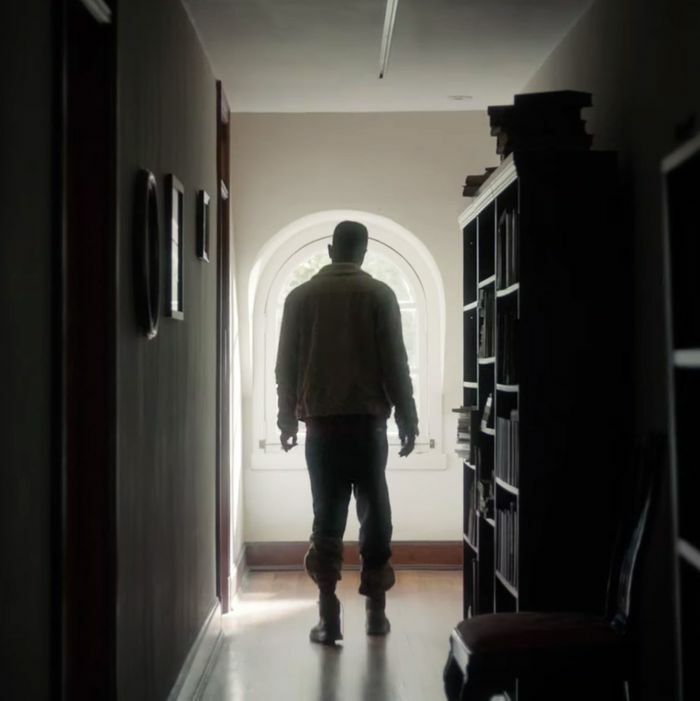 When you place “Teddy Perkins” and “This Is America,” which Murai also directed, side by side, they become curious case studies of how Glover uses horror to explore these ideas, to very different effects and levels of success. In a Hollywood Reporter profile preceding Atlanta’s sophomore season, Glover says that success in this industry takes time: “You have to make them understand you speak their language — that you speak old white man.” Both “Teddy Perkins” and “This Is America” use horror to consider what exactly this means. They act as parables about inherited trauma, the violence it breeds, and the price of achieving fame as a black man in white America. Both incorporate commentary on the evolution of black music, and hip-hop in particular. Both are brimming with references. As Darius grows more entrenched with the ghoulish Teddy Perkins (played disturbingly by Glover himself), who à la Michael Jackson has seemingly undergone plastic surgery in an effort to be rendered white, I felt the influence of Whatever Happened to Baby Jane?, the delirium of Norma Desmond from Sunset Boulevard, Claude Rains’s robed figure from The Invisible Man, and numerous black musicians including Stevie Wonder, who is mentioned by name. Meanwhile, watching Glover dance with wild energy as Childish Gambino in “This Is America,” against a tableau of violence that feels queasily like real-world horrors, numerous references can be found, from minstrelsy performances to the Charleston shooting. But only one of these works feels like it synthesizes its touchstones into a cohesive work and understands the effect of witnessing this violence. “Teddy Perkins” is a masterwork of horror that uses its disparate inspirations and profound sense of dread to create a villain that is at once poignant and chilling. It operates on multiple levels. It can be read as a psychologically pointed spin on a haunted house. In Glover’s aching, unnerving performance, we witness an immediately iconic horror monster take shape. As Teddy and Darius speak about familial tragedies, rap music, Stevie Wonder, and abusive fathers, the titular character synthesizes into something more than his various influences and monstrous visage. He becomes a horrifying emblem of what happens when black people resent their blackness and seek to obliterate it. “Teddy Perkins” immediately felt bracing and potent in its message. But it took watching the video for “This Is America” to understand how easily the use of horror as an interrogation of modern blackness can go awry. In the video, Glover and Murai make blatant and blunt many of the subtextual concerns of Atlanta. Under his Childish Gambino moniker, Glover contorts his face and body in a way that reads as pure minstrelsy. He runs through a gamut of viral and African dance moves. The music video shares Atlanta’s relationship with violence. It’s sudden, abrupt, cataclysmic, only to fade away as easily as it comes into view. Glover has a pointed message in the video, speaking to the same concerns Atlanta raises, about fame as a black artist and the price of playing by a rule book written by white forces (it provides such a variety of references and emotional turning points, it also leaves itself open to multiple readings). But the way he enacts violence against other black folks, only to dip into a recapitulation of minstrelsy, doesn’t ring as a powerful comment on the ways black artists must play by a certain script — it feels hollow and nihilistic. Watching it, I couldn’t help but wonder, who is this video trying to instill fear in? Each of Atlanta’s episodes that delve into horror end with a flash of violence — Van’s panicked attack of the demon thief; Alfred escaping the homeless man’s clutches; the murder/suicide that ends Teddy’s life — and a revelation. Characters learn more about themselves or question what they thought they understood. Violence acts as an emblem of inherited traumas or subconscious fugues. What unites each act of violence is that they speak to how whiteness has warped characters. For Van, it’s her German side that makes blackface seem like a cultural quirk rather than a nightmare. For Teddy and Alfred, it’s the rigors of fame and fortune. The images that have burned in my mind — Teddy Perkins’s introduction, the fear washing across Alfred’s face in the woods when he faces death at the hands of the strange homeless man — feel urgent because they are weighted with the existential concerns of its black audience, who are trying to define themselves in a world in which reality is shifting into further surreality. What it means to be black in America is given an answer: It’s to be in constant flux, to bend toward joy, or at least the peace of making decisions to redefine oneself or one’s sense of authenticity, even as suffering and violence have the potential to bloom on every corner.